The seeds from which various sprouts start life determine the nutritional content of the finished sprouts. 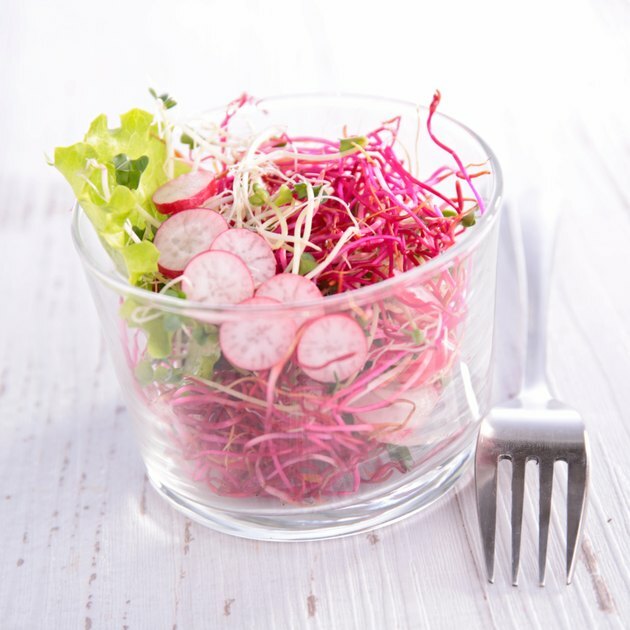 High-protein legumes yield high-protein sprouts, while radish and alfalfa seeds produce sprouts high in antioxidants but low in protein. Look for sprouts at your local grocer or health food store, or start your own from seeds or dried legumes. The average person needs at least 50 grams of protein each day. A cup of sprouts from legumes or wheat provides you with about 15 to 20 percent of your protein intake for the day. The sprouts that emerge from dried peas, also known as split peas, provide 10.6 grams of protein per half cup. Sprouts from dried peas are high in vitamin C and in B-complex vitamins, including folate. They are also a good source of several minerals, including iron, magnesium, phosphorus, copper and manganese. At 150 calories per serving, the sprouts have less than 1 gram of fat, with just a trace of the unhealthy kind. A 1-cup serving of fresh soybean sprouts provides 9 grams of protein. The 85-calorie serving is also high in folate, vitamin C, thiamin and manganese. Soybean sprouts are higher in saturated fat than most other sprouts; the serving takes up 4.69 percent of the recommended daily value for total fat and 0.7 percent of the DV for saturated fat. Germinating your sprouts from wheat seeds yields a product that contributes 8 grams of protein in each 1-cup serving. Wheat sprouts are also higher in calories than legume seeds, at 214 calories per cup. You’ll also get healthy doses of the nutrients for which wheat is known, including B-complex vitamins, iron, magnesium, manganese, phosphorus and selenium. Lentil sprouts provide 6.9 grams of protein per cup. At 82 calories a cup, lentils provide about one-fifth of the folate, manganese and vitamin C you need each day. Lentil sprouts also provide iron, zinc, copper, potassium, phosphorus and B-vitamins in addition to folate. You’ll get 7.7 grams of protein from each 1-cup of fresh kidney bean sprouts. The 53-calorie serving is especially high in vitamin C, offering about 120 percent of the DV for vitamin C in each serving. The sprouts also contribute high amounts of B-complex vitamins, including folate, as well as iron, potassium, copper and manganese. Sprouts germinated from navy beans provide about 6.4 grams of protein per serving. You’ll also get about one-third of the folate and vitamin C you need for the day from the 70-calorie serving. Navy beans are also high in other B vitamins, as well as iron, magnesium, phosphorus, copper and manganese. The serving has 70 calories and less than 1 gram fat.